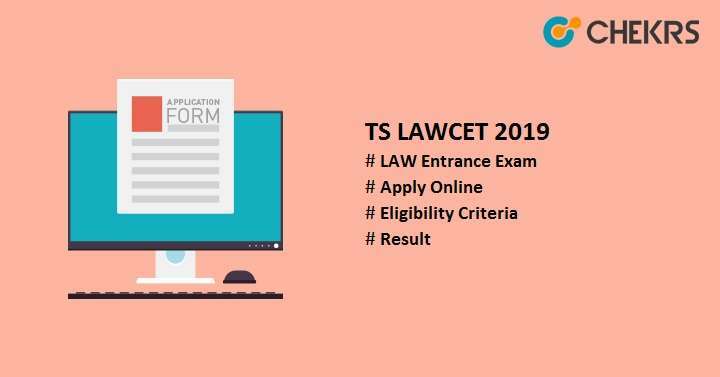 TS LAWCET 2019: TS LAWCET is a state-level entrance test conducted for the providing admissions into the law programme. This exam is managed by the Osmania University on the behalf of Telangana State Council of Higher Education (TSCHE). TS LAWCET stands for Telangana State Law Common Entrance Test. Aspirants seeking admission into 3 year & 5 year law programme can get admission into various government and private institutions of Telangana state through this exam. To appear in this exam,applicants must fill the Telangana State LAWCET Registration Form and submit it before the last date. Here we have mentioned all the basic information related to Telangana Law Entrance Exam 2019. Here we have provided the expected exam dates of TS LAWCET 2019. For 3 year LLB course, candidates must have passed any bachelor’s degree from any recognized university or institutes with at least 45% marks in aggregate. Candidates who want to pursue 5 year LLB course, must have completed senior secondary education from any recognized board or Telangana board with minimum 45% aggregate. Applicants must be permanent residents of Telangana state and must have Indian nationality. No age limit prescribed for the candidates who want to appear in this exam. Visit the official website of TS LAWCET 2019. First register to the student portal with the required details. Upload the all required recent scanned images in the prescribed format. Submit the fee before the last date of submission through online payment gateway. Candidates can also rectify their filled application form, when the correction window opens. The examination fee can be paid through online mode only. Candidates can pay the fee via credit card/ debit card/ net banking/ TS Online. The entrance exam syllabus will be different for 3 year & 5 year law courses. For 3 year, the question will be asked from the graduation level whereas for 5 year LLB/BL course, the syllabus will be of basic level like current affairs, general knowledge & mental ability, aptitude etc. Telangana LAW CET Syllabus will be set be the official authority of Osmania University. Candidate must check the entire syllabus from its official site and prepare yourself accordingly to perform well in the exam. To know the exam paper difficulty level, must check the TS LAWCET Previous Year Question Paper. It will be available on the official site. Candidates must download the sample paper and start their preparation by observing the exam pattern, marking schemas, topics covered & time management. Set a goal and focus on study in organized manner. Make key points on important topics, formulas, tricks etc and revise regularly. Don’t study for 8 hours continuously. Take short breaks between continuous studies. Must look the previous year paper to score good marks. Try to give online mock test. Candidates, who will submit their application form successfully, will be able to download the TS LAWCET Admit Card from the official website through online mode only. Go to the home page of official portal of TS LAWCET 2019. Click on “Download Hall Ticket” option present there. Enter Qualification Examination hall ticket no, date of birth & registration no and then submit it. The admit card will be appeared on the screen. Download it and then take the print of it. The result will be announced after conducting the TS LAWCET examination successfully. Candidates who will appear in the exam can access their Telangana LAWCET Score Card through online mode. Candidates must visit the official portal to download the result. Click on the available link “Download Rank Card”. Enter the Lawcet Hall ticket no, date of birth & registration no and then click on the button “View Rank Card”. TS LAWCET Rank Card will be displayed on the screen. Download it for future use. After the result declaration, TSCHE will announce the TS LAWCET Cutoff that will be the qualifying criteria. Candidates who will score the more than cutoff or equal to the cutoff marks will be considered for the further rounds. Based on the cutoff, qualified candidates will be selected and included in the merit list. The TS LAWCET Merit List will be the final rank list prepared by the university and will be uploaded on its site. As per the criteria set by the University, candidates will be shortlisted and then called for the TS LAWCET Selection Procedure. Candidates have to register themselves to participate in the counselling process. After registration, they will have to fill the choice form for colleges & streams. On the basis of seats availability, candidate’s performance in the entrance exam, choice filled form, seats will be allotted to the shortlisted aspirants. After this, candidates will have to report for the Document Verifications and then to confirm the allotted seat they have to pay the college fee.